The Advantage Chiropractic approach to care involves a neurologically based technique that’s specific, highly effective and corrects the cause of your problems rather than simply masking symptoms as a medication does. One of the many conditions that responds incredibly well to it is one of Dr. Evan’s specializations: headaches and migraines. Migraines are more common than asthma, epilepsy and diabetes combined. 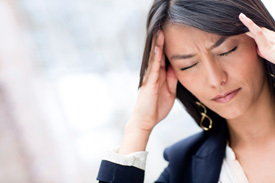 Almost half of the adult population is estimated to have had a headache at least once in the past year. Though common, few people know that a cause can be located and addressed with chiropractic care to give long-lasting relief. Often, a problem is present in your neurology at the top part of the spine, resulting in painful episodes that keep you from being able to complete your daily activities and enjoy life. Dr. Evan’s technique is specific down to the millimeter, seeking a full correction of the source of your problem. Your body contains an infinite amount of intelligence. Dr. Evan utilizes forms of testing that listen to what your body says it requires, addressing your exact needs. While medication may temporarily cover up your pain, you will build up a tolerance to it and eventually, your body won’t respond to the medication. By getting to the cause, we can optimize your neurology and help you to live pain-free. One of Dr. Evan’s practice members was a woman who suffered from daily migraines and thought there was no other option. After one month of chiropractic care, she was down to one migraine a week. Two months in, she had them once a month. By the third month of care, she was migraine-free and continues to receive maintenance chiropractic care to maintain what she has gained, knowing it will prevent her migraines from returning. Contact Advantage Chiropractic now to schedule your complimentary consultation and learn how you can benefit from chiropractic care!